Transparency Market Research (TMR) has published a new report titled, ‘Bioprocess Technology Market - Global Industry Analysis, Size, Share, Growth, Trends, and Forecast, 2017–2025.’ According to the report, the global bioprocess technology market was valued at over US$ 20 Bn in 2017 and is projected to expand at a CAGR of around 9.0% from 2018 to 2026. 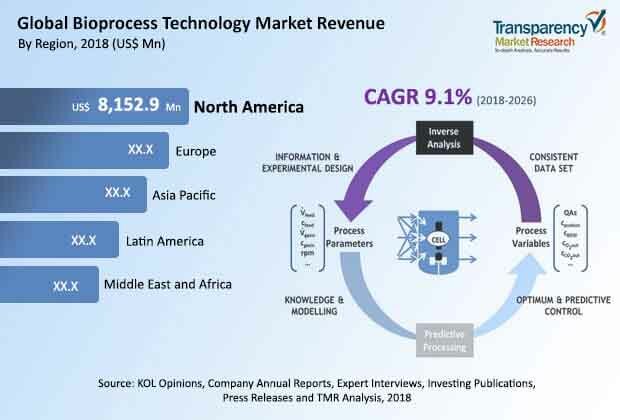 Increase in innovations and technological advancements in bioprocess products, focus on R&D activities by pharmaceutical and biotechnology companies, and growth of the life science industry are anticipated to fuel the global market during the forecast period. The global bioprocess technology market is driven by expansion of the biopharmaceutical industry, flexibility in terms of customization, rise in number of new drug launches, and increase in demand for vaccines. However, limited adherence of biological product development and shift toward stratified medicine are the major restraints of the global bioprocess technology market. North America and Europe are projected to dominate the global bioprocess technology market in the next few years owing to increase in manufacturer focus on business expansion in these regions. Market players are continuously developing advanced products for bioprocess technology and entering into distribution agreements to strengthen their presence in North America and Europe. Rapidly expanding biotechnology and pharmaceutical industries, increased disease prevalence, and rising adoption of several strategies focusing on niche areas are some factors boosting demand for bioprocess technology products and are likely to drive the bioprocess technology market in Asia Pacific. The bioprocess technology market in Asia Pacific is expected to expand at a CAGR of above 9% from 2018 to 2026. The report offers detailed segmentation of the global bioprocess technology market based on product, application, and end-user. In terms of product, the market has been segmented into instruments and consumables & accessories. The consumables & accessories segment is anticipated to account for a leading share of the global market during the forecast period from 2018 to 2026. Increase in demand for cell culture media, reagents, etc. is driving the segment. According to American Type Culture Collection (ATCC) recommendations, reagents are specifically designed in accordance with the cell lines used. The consumables and accessories segment is likely to expand at a higher growth rate in terms of revenue during the forecast period owing to continuous product innovation by major players. The bioreactors sub-segment of the instrument segment is estimated to expand at a high CAGR during the forecast period. Increased use of bioreactors in lab-scale production and pilot-scale production is anticipated to boost the segment. The culture media sub-segment of the consumables & accessories segment domiannted the market in 2017. Increased government and corporate sponsorship and investments in cell-based research are driving the segment. In terms of application, the recombinant proteins segment is projected to account for a major share of the global bioprocess technology market during the forecast period. The segment is likely to expand at a high CAGR from 2018 to 2026. Dominance of the segment is attributed to continuous innovations and research procedures in bioprocess technology by major as well as local players. Rise in acute and chronic diseases globally is driving demand for advanced protein therapeutics for their treatment. With an increase in demand for proteins and vaccines, biotechnology and pharmaceutical companies need to increase production and research studies. Moreover, increase in research studies to understand protein-protein interaction in order to perform several diagnostic tests such as ELISA, RIA, etc. is boosting the segment. The monoclonal antibodies segment is projected to expand at a CAGR of above 9% during the forecast period. In terms of end-user, the biopharmaceutical companies segment is projected to account for a major share of the global bioprocess technology market during the forecast period. The segment is likely to expand at a moderate CAGR from 2018 to 2026. Increase in demand for therapeutic proteins produced through mammalian expression systems is anticipated to drive the market during the forecast period. The contract manufacturing organization segment is projected to expand at a CAGR of over 9% during the forecast period. A contract manufacturing organization offers important cost benefits over an organization’s internal production facilities, which is one of the major market drivers of the segment. The contract research organization segment is estimated to expand at a rapid CAGR during the forecast period. A major factor driving the contract research organizations segment is the ability of the organizations to conduct diverse tasks for clinical studies as they have a competent and professional workforce. In terms of revenue, North America dominated the global bioprocess technology market in 2017. The predominance of the bioprocessing technology market in the U.S. over that in Canada in 2017 is owing to the high sales of biopharmaceutical products, higher number of academic and research organizations, and higher number of biopharmaceutical manufacturing plants in the U.S.. However, a shift toward stratified medicine and limited adherence of biological product development are likely to hamper the market. There has been a rise in health care spending and the number of research studies in countries such as China and Japan. This fuels the bioprocess technology market in Asia Pacific. Development of health care infrastructure, expansion of the biotechnology industry, and rise in the burden of diseases necessitating diagnostics are likely to boost the market in Latin America from 2018 to 2026. The report also provides profiles of leading players operating in the global bioprocess technology market. F. Hoffmann-La Roche Ltd, Sartorius Group, Thermo Fisher Scientific, Inc., and Danaher are major players operating in the market. They offer a wide range of bioprocess technology products. Expansion of the bioprocess technology product portfolio through partnerships to improve efficiency and quality is a rising trend in the global bioprocess technology market. For instance, Sartious AG has integrated its unique ambr15 cell culture microbioreactor system technology with Nova Biomedical’s BioProfile FLEX cell culture analyzer. The collaboration is expected to help Sartorius strengthen its position in the bioprocessing technology market in the near future. Other prominent players in the global bioprocess technology market include Advanced Instruments, Nova Biomedical, Siemens Healthineers, GE Healthcare, Becton, Dickinson and Company, and Lonza.